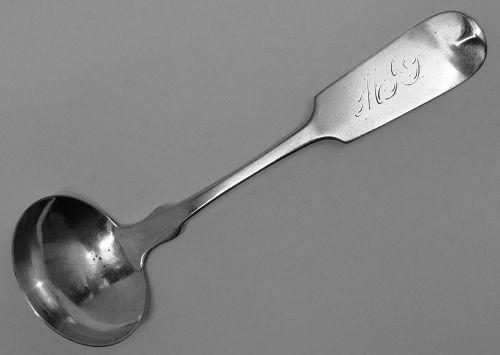 Offered is a nice American coin silver sauce ladle by F. Franks & Co., and also marked DOLLARS in reference to the standard of silver used. This piece has a somewhat worn period engraved script monogram, and a legible maker's mark. The mark denoting fineness is very well struck. This piece measures about 5 3/4 inches in length and weighs about 22 grams. Condition is very good overall, with moderate surface wear and no dents, splits or repairs. All in all a nice small serving piece in coin silver!